It's insulting to ask a dramatist what his view of his play is. I have no opinion. He is the author of some fifty plays among them Saved (1965) the production of which was instrumental in the abolition of theatre censorship in the UK. 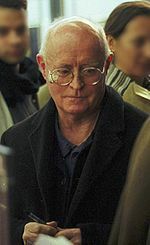 Edward Bond (born 18 July 1934) is an English playwright theatre director poet theorist and screenwriter.